Restraints on Korean companies may be taken to the process of investor-state dispute settlement, as stipulated in the trade accord. But experts say it would carry too much risk for Hyundai, Lotte and other Korean firms to sue the Chinese government. China has shown no hesitation in disregarding its obligations under the free trade agreement with South Korea to take retaliatory measures against the deployment of a US missile defense system here. This behavior is reinforcing the perception that Beijing cannot be expected to abide by international norms, such as the separation of politics from economic affairs, when it feels the need to advance or defend its interests. China is threatening to intensify retaliation against South Korea after additional launchers for the Terminal High Altitude Area Defense system were deployed last week in response to North Korea’s latest and most powerful nuclear test. There were hopes the free trade deal signed in 2015 would help eliminate discrimination against and strengthen protection for South Korean companies exporting to and investing in the world’s second-largest economy. But it didn’t take long before the country’s trade negotiators and corporate officials realized the deal was not enough to guarantee free and fair business with China. Beijing began to take retaliatory steps in July last year, when Seoul agreed to the deployment of a THAAD battery to cope with growing nuclear and missile threats from the North. China says the deployment poses a threat against its own security interests. The installment of the first batch of THAAD launchers and a radar earlier this year led China to step up its reprisals, while Chinese consumer sentiment sours against South Korean products. 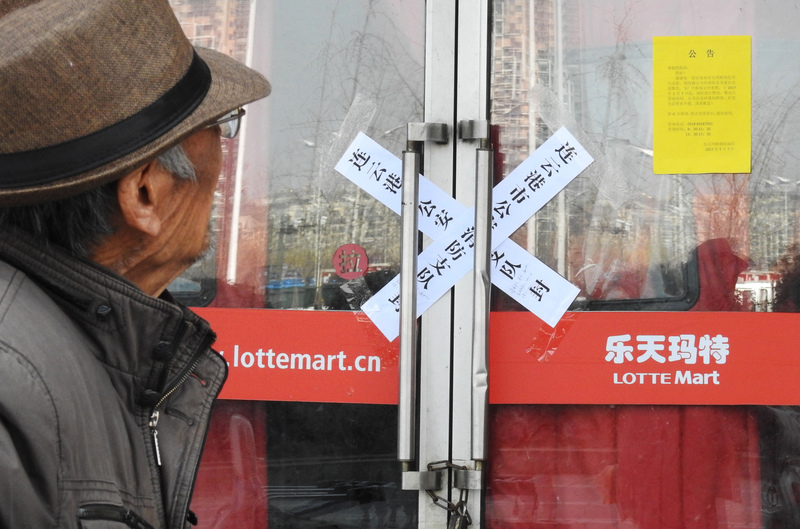 Since March, retail giant Lotte has been ordered by Chinese authorities to shutter 74 of its 112 outlets in China for violations of safety, sanitary and environmental regulations — rules which have not been applied to other chains. It has suffered losses of about 500 billion won ($442 million) over the past six months, with its sales there in the second quarter remaining at a mere 21 billion won, just 7 percent of the turnover during the same period last year. Hyundai Motor saw its Chinese sales in the first seven months of this year decline by more than 40 percent from a year earlier to 351,292 units. Its factories in China were recently compelled to stop operations for days as local suppliers suspended parts delivery due to delayed payments. Hyundai Motor has been restricted from remitting cash from here to Beijing Hyundai Motor, a 50-50 joint venture with a Chinese state-owned firm, to ease its financial crunch. BAIC Motor, the Chinese partner, is pressuring Hyundai Motor to change parts suppliers to local ones to reduce production costs. The Chinese government has also excluded electric vehicles equipped with Korean-made batteries from its subsidy schemes. Such restraints on Korean companies apparently run counter to the provisions of the trade accord, which guarantee most-favored-nation treatment and nondiscrimination against local businesses. China can also be deemed to have disregarded the free trade deal by imposing an unofficial ban on group tours to Korea and banning the country’s pop artists and cultural contents from entering the Chinese market. Corporate discontent with Seoul’s passive response to Beijing’s retaliatory moves has been rising. “China’s retaliation regarding the THAAD deployment is an issue that should be dealt with on the government level,” said an official at a Korean business association, requesting not to be named. “But the government has so far prodded companies to work out responsive measures on their own,” he said. Most restraints on Korean companies may be taken to the process of investor-state dispute settlement, as stipulated in the trade accord. But experts say it would carry too much risk for Hyundai, Lotte and other Korean firms to sue the Chinese government. Under their free trade accord, South Korea and China run a ministerial-level joint committee and 13 subpanels in charge of special areas to ensure the obedience of obligations on both sides. But Seoul has remained cautious on calling for these subpanels to be convened to protest Beijing’s retaliatory measures. A government task force set up to deal with trade issues with China plans to hold a meeting this week to discuss ways to respond to the possible strengthening of China’s reprisals. An official at the Ministry of Trade, Industry and Energy said South Korea will raise issue with China’s retaliatory moves at some subcommittees’ meetings scheduled to be held later this month. He said the ministerial-level joint committee has yet to arrange for its next biannual conference. Its session in January, which was attended by director general-level officials, shunned the issue of China’s economic retaliation. Beijing’s disregard of the trade accord would be further spotlighted if it keeps itself from negotiating with Seoul on details of an agreement on service and investment by the end of this year as envisioned by the 2015 pact. Choi Won-mok, a professor at Ewha Womans University Law School, said the government’s response to China’s moves seemed little different from dereliction of duty. He said South Korea needs to react more strongly, for instance, by sending a signal it could consider withdrawing the market economy status given to China. Citing China’s unfair practices, the US and other Western advanced economies have refused to grant such status to China as agreed upon when China joined the World Trade Organization in 2001.